Based on the seminal Batman: The Animated Series, the Mr. 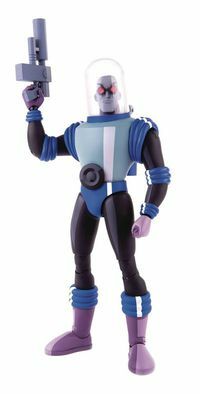 Freeze 1/6 Scale Figure stays true to the animated classic - sculpted to match the iconic style of the show, and with a paint scheme evoking to bold, graphic look of an animated cel. Featuring approximately 28 points of articulation, multiple switch-out hands, heads, accessories, and a Bat Symbol figure stand, Mr. Freeze is ready to extract cold vengeance on you and your collection. Legal Notice: Entire contents trademarked (® or TM) and copyrighted (©) 1986-2019 by Things From Another World, Inc. and respective copyright and trademark holders. All rights reserved. Page rendered at 2019-04-25 19:27:10 in 0.313 seconds.